My Go To HAIR Products | Albatroz & Co. In honour of the new Hair category on Albatroz & Co. I will be sharing in this post why and how I became a natural and also sharing with you all my go to hair products. I have been natural about two years now I’d say although I don’t quite remember the day I went natural. For those of you who may not know what natural African hair is, it is hair that has not been chemically treated to reduce or completely remove the hair’s natural curliness and therefore straighten it. From my earliest memory I have always had chemically straightened hair. In fact talks of having natural hair only applied to ‘bush girls’ who didn’t care about their appearance and by extension were seen as having no respect for themselves and therefore not receiving any from others. When I expressed my own desire to my mother to go natural, I am sorry to say that I was met with somewhat of the same tone of disapproval and judgement. I would look like trash who didn’t take care of herself and was warned against it by many people. Even now I still receive comments from men and women, some known, some unknown of how disgraceful the natural state of my hair is. However these misconceived opinions are not the purpose of today’s post and will not be battled against now but maybe in a future post. This picture is from my very first post on Albatroz & Co. which you can check out Here. I think it's fair to say my blogging game has changed an awful lot since and so has my hair! It was early evening I believe and I should have been at athletics training but I was at home despairing over my seemingly miserable life, or at least that’s how 16 year old me felt. I had been researching natural hair, reading threads and subscribing to every natural hair site that my friend who had gone natural had compiled for me. Curly Nikki, Naturally Curly, Black Girl Long Hair, you name it, I was there. I had even started the process of transitioning without doing a big chop. But in my room that night, I had an overwhelming need for change, to be able to change something I had control over. And so I took a pair of scissors I’d bought in Dealz to my hair and hacked of all the chemically straightened hair. It didn’t get rid of the miserable feeling, as if chopping of the ends of my hair would cut away those feelings too. However it made me not care enough to do something that I would have been undecided about for months and spent time I didn’t have trying to treat two different hair types. Since then I’ve come to find products that work for my natural hair as it is and some are recent enough finds and others I have been using since before going natural and would stick by. 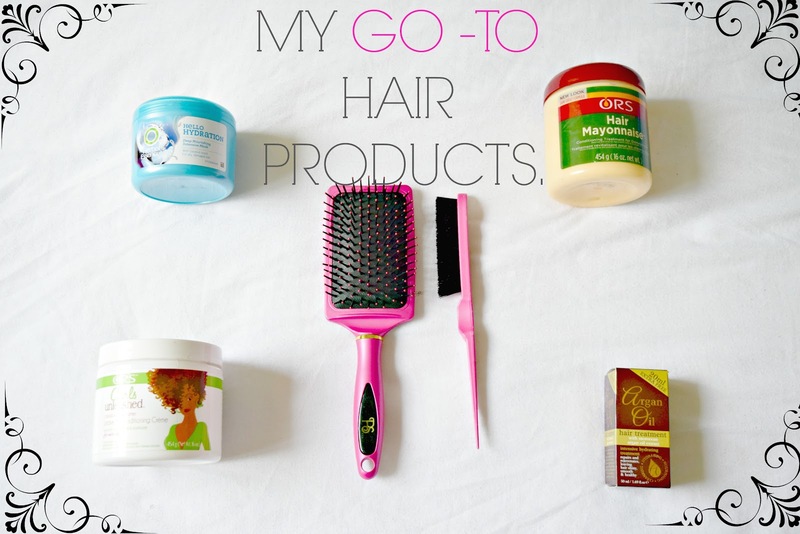 So without further ado, here are my go to products for natural hair. The prospect of hair mayonnaise use to bring to mind the same feeling of ‘ewww’ that I get when I tell people who aren’t naturals about it. ‘Why would you want to put something called that in your hair?’ they’d squeal with slight disgust and intrigue. But honestly I swear by this stuff. I normally like to make my own protein masks and have shared one of my favourites on Albatroz & Co. before which you can check out Here. However there are times where I don’t always get the chance to prepare something or just don’t have the ingredients at hand. Those are the times I turn to my ORS Hair Mayonnaise. My hair always feels so much more strengthened and I can see and feel the fortified elasticity in it. I’m not much of a pro on the scientific side but it never fails to make my hair feel nicer, softer and stronger. This is one of my recent finds. When I started my transition and proceeded to the Big Chop I was using the Argan Oil hair mask, which wasn’t really doing anything for my hair and for a while I moved from product to product trying to find one that worked and didn’t go out of stock for months at my local pharmacy or Euro store. I had been using the Herbal Essence Hello Hydration Shampoo and Conditioner and when I came across the Herbal Essence Hello Hydration Hair Mask I figured there'd be no harm in having a go at it and have been using it for the last six months or so. I find that it does leave my hair moisturized for about two days if I were to go without a leave-in conditioner. However I still feel there could be better out there, so I’m on the look out for something else to look at. If you have any suggestions, please let me know in the comments below or on any of my social media. Four Countries, One Year: Find out the third stop here. I promise this post is not sponsored by ORS in anyway, I just really love their products and use a lot of it! I first came across this Leave-In in my local Boots store at the very beginning of my natural hair journey and opted not to go for it because at the time I didn’t see much use for it when I was wearing braids all the time to hide my transition. However back in July I bought one before going to Ghana and have not looked back since. I absolutely LOVE it! I use it all the time. It’s become my almost-nightly routine to part my hair into four and comb through each cluster with my Curls Unleashed Créme. For €9.99 I’m torn between the cost of it and how much of it there is. It’s a 545g/16 OZ. jar and it has lasted me four months now so you can definitely make it last. Another pick from the early stages of my natural hair journey. This is not the pure Argan Oil you’d get in the Pharmacy/ Drugstore that costs about €15 for more or less 50ml. This is one I get from Dealz for €1.50 quite cheaply and much to the joy of my wanting student budget. It’s quite heavy so I often put it on in the evening after my Curls Unleashed Leave-In and wrap my hair up in my silk wrap. By the morning my hair would’ve absorbed the oil, sealed in the crème and gained the glossy shine from the oil without the feeling of residue when you run your hands through it. And those are my four go to hair natural hair products. What are some of your go to hair products? And what have I missed on my list that I should definitely be using? I'd love to know. Before you go onto your next post ( because why would you be leaving the site ), why not grab a pin for the road?